Both can send a signal as far as 30 feet, but only one does 1080p. Devices that allow you access to multiple streaming sources are nice, but even the best is limited. If you want to be able to get video from any source you can think of, there's only one way to do it - use a PC. Since keeping a computer next to the TV isn't optimal for everyone, wireless streaming devices have been rising in popularity. They allow you to show video from a laptop or PC without having to hook up any wires or upset the look of your room. The latest of these is the StreamHD from Warpia. 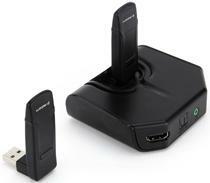 It allows you to stream video at 1080p and 5.1 channel surround sound wirelessly up to 30 feet. It's available now at $169. For $129 you can step down to the much less cleverly named Wireless USB PC to TV Display Adapter, which gives you 32-bit color, but only a 720p resolution.